Do your students need more multiplication practice? Students learn multiplication facts quicker when they have hands on, interactive activities to do. I get my students’ minds working with these fun multiplication activities. Answer keys are provided so you can easily mark the pages. If you want students to mark their own worksheets, the answer keys are easy to read for student use. 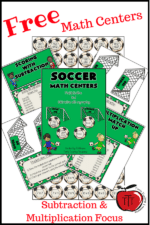 Are you looking for more FREE multiplication centers? Here are some fun soccer themed math centers that are for multiplication facts and multi-digit subtraction. Fern Smith’s Multiplication Identity Property of One Center Game!